There appears to be a part missing from the roof rack just behind the vista window. Photo below, something belongs in that track. What do I need? who can spare one? Nothing. You can swap out those tall racks for the 91-93 low profile one that fits that shape perfectly, however. That rack will cover that area when slid all the way up. Lots of pics on google. I once thought the front track would accommodate the sliders used on the sides to provide tie-down points. However, there does not appear to be a way to get the square nuts in the track without disassembly. You must remove the rear retainer to remove the square nuts, and install the low rise cross bars. 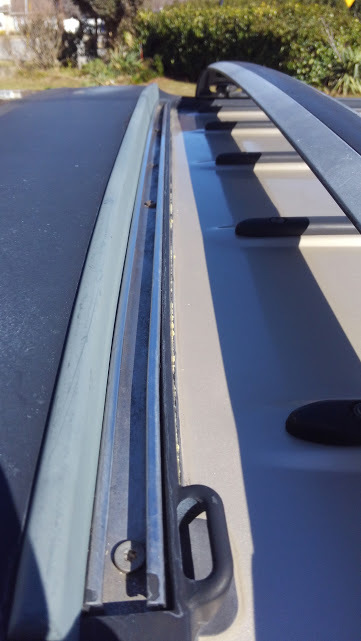 Subject: Re: what's missing from my roof rack ?